Aldridge, Erastus, was born in Victor, Ontario county, April 10, 1836, a son of Gilbert Aldridge, of Orange county. The family were of English descent, and early settlers of Massachusetts. Gilbert married Keziah Tooker, and made the journey from Orange county to Victor in an ox-cart. In 1855 he came to Sweden, this county, where he engaged in agriculture. He died in 1867, in his seventy-sixth year. Erastus was educated in the Brockport Collegiate Institute, and in 1860 married Frances A. Green, who died October 12, 1869. He married, second, in 1871, Mrs. Julia H. Wiltsie, daughter of Alpheus Vrazey. In 1868 he engaged in the grain, produce and wool business, which he still continues. Our subject is one of the leading business men of his town, taking an active interest in all local matters. Allen, Isaac, was horn in Clarkson, October 15, 1822. His father was Isaac Allen, a native of Enfield, Conn., and the family were of Welsh descent, and trace their descent from John Allen, who was buried at Enfield in 1640. Isaac came to this county in 1815, and a year later returned to Connecticut, and married Mary Terry, returning to Clarkson, where he was identified with the hat business for years. He died in 1885, in his ninety-first year. In 1848 Isaac married Rebecca A., daughter of Allen Hobbie, and they have one son, Orel S. Capt. Henry Allen was born in Clarkson April 26 1836 and in 1862 enlisted in Co. A, 140th N.Y. Vols., and participated in the battles of Fredericksburg, Chancellorsville, Cold Harbor, Gettysburg and Petersburg, holding the rank of captain before his honorable discharge in 1864. Returning to the farm, he married, in 1865, Addie Henyon, who died in 1872. In 1876 he married, second, Helen E. Perrigo, daughter of Guy P. Perigo, and they have five children: Claude A., George R., Barton H., Mrs. Maud A. McClenithen, and Bertha Allen. Mr. Allen has served as assessor and supervisor, and has held a prominent position in public affairs. Allen, Chauncey, was born in Clarkson, May 26, 1818, a son of Capt. Isaac Allen, a native of Enfield, Conn, who came to this county in 1816 and settled in Clarkson, where he carried on the hatter's trade. He also spent some time in Brockport. His wife, Polly Terry, was a daughter of Solomon Terry, and they were the parents of ten children. Our subject was one of the prominent men of his town, serving as road commissioner, when roads had to be laid through the unbroken forest, was supervisor, and took an active interest and part in all moves for the good of the town, being a man whose good judgment was well known. Chauncey Allen was educated in this town, and through life has been engaged in agriculture. His wife was Susan, daughter of Gideon Holmes, and their children are Mrs. Celia Steele and Mrs. Frances Vicars. Arnold, Aaron, son of Daniel Arnold, was born August 15, 1787, and was one of Ogden's prosperous farmers. He married Roxie Brown, and had these children: Esther, wife of Capt. J. W. Webster, James N., Aaron, Bradford, Henry, Maria, and Edwin. James N. Arnold was three times married. By his first wife, Sarah Ross, he had two children, John W. and Sarah. By his second wife, Susan Mershatt, he had one child, Aaron J., now one of Parma's most prosperous men. His third wife, Calista Marsh, bore him nine children: Alfred M., Susan C., Oscar M., Henry, Marian and Theron (twins), Isabelle, Nettie, and Esther. James N. Arnold died in Ogden in 1892, having been for many years a deacon in the Presbyterian church. Aaron J. was born April 3, 1843, and lost his mother in extreme infancy. He was then taken by the Clark family of Parma, and reared under the instruction of the Misses Susan and Hannah Clark. January 31, 1866, he married Mary E., daughter of Alexander McGough, of Jackson, Washington county, and they have three children: Jennie C., wife of Eugene Hay, of Spencerport; Abner W., who married Elsie Lapp, and Lewis A., who married Sadis Nichols. Mr. Arnold has served as assessor six years. For nearly thirty years he and his wife have been active members of the Spencerport Congregational church, and for twenty-five years he has been a deacon. Elijah Clark came with his family to Ogden in 1840, driving from Salem, Washington county, with a team. They settled in Parma, where Mr. Clark died in 1858, and his wife in 1848. Abercrombie, John, was born in Orange county in 1815. He came to Rochester in 1850, where he was for fourteen years engaged in contracting and building. In 1864 he came to Webster, and bought the farm where he now lives, lie built most of the brick buildings in Webster, but since 1885 his time has been mainly devoted to farming. He is a son of John Abercrombie, who came from Ireland and was for many years a merchant in Newburgh, N. Y.
Adams, Orlando C., was born at Penfield, August 4, 1859. His father, the late John C. Adams, removed to Fairport in 1873, and engaged in the manufacture of pumps. He was a citizen of much moral character and worth, honest and upright. He was at various times constable, collector and overseer of the poor. His death occurred in 1892, at the age of sixty. Orlando is the only child living, another son, William, having died when twenty. Orlando for a number of years conducted a retail market on West Avenue, and in 1892 erected storehouses for the preservation of ice, the distribution of which has become an important industry. Mr. Adams's personal citizenship is of the highest character and he is justly esteemed among his fellow men. A member of the Free Baptist church, of which he is a deacon, he has superintended its Sunday school since 1888. To his personal efforts as a director of the Y. M. C. A., that organization owes much of its success, and the cause of prohibition has his earnest sympathy. In 1882 he was deprived by death of his wife Inez, a daughter of Mrs. W. B. Bly of Fairport, after a married life of about one year. She left one son, Orlo H., born October 18, 1882. The present Mrs. Adams is Etta, daughter of Henry B. Hull of Penfield. She was born in 1870 in Albany, which was her home until the age of sixteen. Ayrault, Allen - If any one familiar with local affairs were asked to name the representative farmers of Perinton, he would without doubt accord a high place to Allen Ayrault, of whom it may be said with absolute truth that is the architect of his own fortune. Born at Caledonia, N. Y., December 27, 1827, he is one of seven children of the late John Ayrault. From a small beginning, but by unremitting toil and aided by a real genius for his vocation, Mr. Ayrault has achieved a success beyond the average, and while yet in the prime of life, may enjoy its fruits. He now operates over 300 acres of land, and makes a specialty of breeding choice horses and cattle, among them many prize-winners. In 1873 he married Lovilla Smith. daughter of Eleazer Smith, of White Pigeon, Michigan, and has three children living: Allen, jr., John W., and Edith. One son and one daughter died in early infancy. Brown, Cyrus E., a farmer and seed grower of Henrietta, was born in Chenango county in 1832, a son of Ephraim P. Brown, of Connecticut, horn in 1799, whose father was Nathan Brown of that State, and who served in the Revolution. The latter removed to Chenango county in 1807, and there spent his remaining years, as did also his son Ephraim, father of our subject. The latter served as supervisor etc., and was a prominent citizen. He married Orilla Hicks, by whom he had eight children, five now living. Cyrus E. began for himself as a farmer. Leaving home at the age of twenty-six in 1858 he went to Groton, Tompkins county, where he spent eight years in farming, and a year in the village. In 1867 he returned to Cayuga county, and two years later removed to Henrietta, and bought his present farm of fifty acres, where for a number of years he has made a specialty of raising a fine quality of sweet corn for seed purposes. He has taken some interest in politics, having served as justice. In 1858 he married Marian Weaver, who died two years later, leaving one child, Marian F. He married, second, in 1861 Adelia A. Allen, of Tompkins county, and their children are Nellie J., deceased, and Wesley E.
Bradshaw, Isaac Leonard, was born in 1844 in Irondequoit, where his father, Lorenzo C., lived. Mr. Bradshaw came to Webster in 1863 and purchased his present farm. In 1864 he enlisted in Co. M, 4th N. Y. Heavy Artillery serving until the close of the war, when he returned to this town. Mr. Bradshaw has three sons. R. F., Charles, and George. Brown, Olivia representing one of the leading families of the town of Penfield in the olden time, was born in that town, the elder daughter of the late Abner Brown. Abner N. Brown was himself born in Penfield, his father's people being residents of New Jersey. His principal business was farming, but he took a leading part in town affairs, and nearly all the official positions within the gift of his townsmen became his, trusts to which his fidelity was marked and uniform. He was an original Republican, dating from the formation of the party. In 1873 he retired from the activities of life, removing to the village of Fairport, where his death occurred at sixty- eight years of age, March 3,1881. His children are Olivia, E. Alcesta, Lycurgus W., and Rollin. Butler, Preston W., was born in Penfield in 1832, a son of Elias Butler, who came from Massachusetts to East Penfield. Elias Butler married Caroline, daughter of Lyman Tripp, of Penfield, by whom he had six sons: James, Amasa, Preston W., Benjamin T., William and Samuel. Preston W. has for the last ten years been engaged in raising hot-house stock and now makes a specialty of Clematis plants. He was prior to this time engaged in the nursery business. He settled where he now lives in 1867. His grandfather, John Butler, Came from Ireland, settling in Massachusetts where he died. Hon. Francis A. Macomber, J. S. C., born in the town of Alabama, Genesee county, N. Y., April 5, 1837, was a son of William Macomber, an early settler and a prosperous farmer, upon the so-called "Oak openings" of that once famous wheat region. He spent his boyhood days upon his father's farm, and in attendance at the district schools of the neighborhood. He studied at what became the Oakfield seminary, and also a year under the tutelage of Prof. A. G. Williams, at Fayetteville, N. Y., and prepared for college at Middlebury academy in Wyoming, N. Y., where he had as classmates a number of young men who afterwards rose to positions of prominence. He entered the university of Rochester in 1855, and was graduated with honors and with the degree of Master of Arts, in the full classical course in 1859, winning several prizes during that period, one of them being first prize in the sophomore speaking contest. He was one of the first members of the Alpha Delta Phi fraternity, and throughout life took an active interest in its welfare. When a chapter of Phi Beta Kappa was established in Rochester, he was honored with a key to that society. Immediately after his graduation Mr. Macomber began the study of law in the office of the late Judge Henry R. Selden, and commenced the practice of his profession in Rochester, in December, 1861, continuing successfully without a partner until 1878, when he was elected to the Supreme bench in the Seventh judicial district, the duties of which he assumed January 1, 1879. In February, 1888, he was appointed by Governor Hill to the appellate branch of the Supreme court, known as the general term of the Fifth judicial department. In November, 1892, his term of office expiring, he was again elected a justice of the Supreme court, receiving the endorsement and support of the Democratic as well as the Republican party. He held this position until his death, which occurred in Rochester after a prolonged illness, on October 13, 1893. Judge Macomber stood in the front rank of his profession; as a lawyer he won success in general practice, but probably his greatest achievements were in the realm of patent law. His writings consist chiefly of legal opinions found in the law reports and in other works devoted to special subjects; and essays and orations delivered on various occasions. He always took a lively interest in public affairs, and especially in the growth and well-being of his alma mater, the university of Rochester, of which he was long a trustee, and which conferred upon him the degree of LL.D. on June 14, 1887. Judge Macomber's first wife was a daughter of his legal preceptor, Judge Selden, who died leaving two children, Francis S., now a practicing attorney, and Augusta. He afterwards married Mary, daughter of the late Isaac Butts, of Rochester, who with three children from this union, survives him. Bellinger, Moses C., of Dutch ancestry, was born in Danube, Herkimer county, in 1837. His grandfather, John C., was a prominent farmer in that locality, and in the stage-coach days kept a public house. Of his eight children, Christopher was the father of Moses C. The Bellingers are a numerous family along the Mohawk Valley, and are nearly all farmers. Christopher married Pauline Walrath of Danube, and they reared four sons and three daughters: Mary M., Hiram W., Moses C., Mrs. W. Bostwick, Gertrude, Harriet, and Joram, all of East Bloomfield, to which place he came in 1866, and where his children attended the academy. Moses married Alice A., daughter of Oscar G. Cummings, a retired farmer of East Bloomfield. He bought a farm of 114 acres in Mendon in 1882, where he has since lived. There were three children: Ralph, born in 1882, Christopher in 1890, and a daughter Gertrude, who died in 1886 aged two years. Mrs. Bellinger's grandfather was Benjamin Cummings, an early settler of Bloomfield, coming from Massachusetts in 1794, and he helped erect the third building in Rochester. His son Oscar married Alice A. Beach of Bloomfield. She had one brother, Thomas, who died when a child. Her mother died in 1863. Baker, Nathan C., was horn in Hoosick, N. Y., February 26, 1830, an elder son of Noah Baker, one of the early settlers, who came about 1835. Mr. Baker has been a farmer most of his life, located on the southern boundary of the county near Fishers, a locality noted for its excellent land and fine scenery. In 1851 he married Mary Aldrich of Victor, and they had two daughters and a son: Noah A., who manages the homestead farm, Mrs. Jane Pickering, and Mrs. Belle Pickering, both of the d:tnghters living almost adjacent to the homestead. In 1857 Mr. Baker went to Delaware, remaining two years. Baker, William, of Perinton, younger son of Noah Baker, was born December 21,1836, at Hoosick N. Y. Noah came here about 1837 clearing off his own land, and withstanding all the privations incident to life in an unsettled region. His wife, the mother of his two sons, was a real helpmeet, spinning and weaving their homespun clothing. William Baker inherits in a large degree the sterling, substantial qualities that distinguished his paternal ancestry. His wife is a daughter of Alexander N. Bumpus, and a sister of William Bumpus. They have no children. Birch, Benjamin, of B. Birch & Sons, Fairport, gardeners and florists, is of English birth, and came to America at the age of eighteen. He was born at Buckinghamshire, England, in 1839. His father, Joseph Birch, was a farmer in moderate circumstances, and unable to afford his children full educational advantages. Benjamin habitually spent his evenings in study and reading, while his days were engrossed by hard work on the farm. Emigrating in 1857, he became a farm employee near Palmyra, Wayne county. and by unremitting industry and frugality acquired a competence, locating in Fairport in 1879. In 1860 he married Mary Hallenbeck of Palmyra, and their twelve children are living except one son, Linden, who died aged sixteen. Mr. Birch is a steward of the M. E. church and an earnest advocate of prohibition. Barnhart, Orrin B., late of Fairport, was born at Lansingburgh, N. Y., and settled in Perinton at an early date, where the remainder of his life was spent, a man of rugged virtues and sterling character. For his second wife be married Mary A. Bolton, of Coburg, Ontario, now Mrs. William H. Pockett, whose kindly ministrations soothed his last years. Mr. Barnhart left two children, Lewis and Hannah. Bancroft, Ellis W., is a son of Simeon Bancroft, who was long a resident of Walworth, Wayne county, later removing to Michigan, where he died. E. W. Bancroft came to this town in 1885, and after a period of five years engaged in the produce business; he went into partnership with J. H. Thatcher, now carrying on a hardware and furniture trade at Union Hill. Mr. Bancroft married Hattie, daughter of Rev. C. B. Hart, and they have one son, Glen. Howes, George E., only son of the late Ezra F. Howes, who was born at Lenox, Mass., in 1811. came here when two years old where his life was spent. He died February 13, 1892. The only other child was a daughter who died in infancy. Judge Howes received his early education at the famous old Clover Street Seminary and has extended it by personal research and observation. Besides some minor official positions, he was for a number of years justice of the peace, and an associate judge for four years. He has been the recipient of the highest honors of the Masonic fraternity. In 1873 he married Belle Nash, daughter of the late John Nash of Brighton. Humphrey, W. S. - Prominent among the physicians of the past in the town of Chili was Dr. David Starkey, who was born in the town of Guilford, Chenango county, N. Y., March 28, 1812, and was a son of John Starkey, who came from England. Dr. Starkey was educated at Fairfield College, New York, and the College of Physicians and Surgeons of Western New York, at Geneva, receiving his diploma in 1835. He first located in Stafford, N. Y., but in 1837 he settled in Clifton, where he had an extensive practice. A few years later he purchased a large farm in the southern part of the town, where he died in 1886. For over forty years he was actively engaged in the practice of his profession, enjoying an extensive and profitable practice. During the last years of his life he gave his attention to agricultural and horticultural pursuits. Dr. Starkey was a prominent member of the Clifton Baptist church and was also a member of the Monroe County Medical Society. He served four years as supervisor of the town of Chili. Dr. Starkey was twice married, his first wife being Caroline Whiting. He afterward married Almira H. .Humphrey, who survives him. Garrison, Elias, was born in Ulster county, June 17, 1830. His father, William, was a native of that county, where he was a prominent and much respected citizen. He was also a soldier in the War of 1812. In 1853 Elias came to this county, settling in Clarkson. In 1855 he married Nancy, daughter of Daniel B. Thorn, and they have one son, Richard E. Our subject is one of the practical and successful farmers of his town, served as supervisor in 1861-62, and takes an active interest in all public enterprises for the good of the town. Gorton, Ezra, came from Chenango county in 1840, and settled or the farm in Parma now owned by his descendants. In his family were two children, William and Lovina, deceased wife of James Brockway. William was born August 18, 1823, and during his long residence in Parma became known as one of the successful and enterprising farmers of the town. He became possessed, of the homestead farm after the death of Ezra, and in 1854 married Persis Davis, by whom he had five children: Charles, of Rochester; Fred, of Parma; Waite, of New York; Nellie, wife of Edward Smith; and John, of Parma. William Gorton died July 7, 1889, and left to his heirs one of the best farms on the Ridge, it being now managed by his sons, Fred and John. John Gorton married Nettie Perrin. Hiscock, Rev James W., was born in 1810 in Duanesburgh, a son of William, a pioneer of Ogden. James resided in Ogden until 1828 when he came to reside with his brother in Parma. He taught school for a time, and during his young manhood entered the Universalist ministry, having had in childhood a serious affliction which prevented him from active manual labor. Mr. Hiscock is reputed to have a more thorough knowledge of the Bible than any other man in the county, as he can quote at will from any chapter. Mr. Hiscock preached his first sermon at Farwell's Mills, but his later. charges were chiefly in Parma, Webster, Hamlin, and Clarkson. He owned a good farm in Parma, and his ministry was purely a matter of doing good, and not for gain, as he declined salary. In 1835 he married Laura A. Wood, and they resided on the farm after December, 1836. Their children were James Duane, a soldier in the 13th N. Y. Vols., who died in 1867 from disease contracted in the service; John A., of Parma, Frances H., who died in 1843, and George F., who died in 1883. Rev. James W. Hiscock died in December, 1892, and his wife April 18, 1893. John A. Hiscock was born in Parma June 7, 1838, and has lived here all his life, following farming and the practice of veterinary surgery, in which he has achieved much success. In 1861 he married Jane, daughter of John Goodell, of Parma, and they have one child, Frances E., wife of Edward McCabe. He has served about eight years as road commissioner, and is an active Republican. John Goodell was a son of William, who came with his parents from Cherry Valley to this town. John married Emeline Everson, and they had three children. Huber, Clement, was born in Baden, Germany, November 22, 1830, son of Joseph Huber, who was a mason by trade, and his sons were brought up in the same occupation. The eldest of the boys, John, came to this country in 1846, settling in Parma. Clement followed in 1852, and Frank, still younger, came in 1860. Clement lived with John for two years, then began for himself. He carried on his trade of mason in connection with a small farm. In 1858 Mr. Huber married Mary Ann Snyder, by whom he had six children: Julia, wife of Peter Ring; Jessie, who married John J. Jones; Frank, who died in childhood; Charles, of Parma; George, of Ogden; and Cora, who died young. Clement Huber began his career in Parma with but one dollar in his possession, but a life of toil has earned a comfortable property. He is a member of the Baptist church at Parma and a prominent member of the Parma Lodge of Odd Fellows. Jonathan A., Snyder came to Parma from Montgomery county and was a pump maker by trade, but became a farmer later in life. He married Nancy Mather, by whom he had three children: Mary Ann, who married Clement Huber; Almira, who married William Worthington; and Maria F. He was killed in a runaway on the Lisle road in 1866. After the death of his first wife, Mr. Snyder married Mary Watrous, by whom he had two children, Watrous and Susan. Gillett, John, of Connecticut, came to Ogden from Livingston county in 1825, having been a pioneer in the Genesee country, although he had resided in Sullivan and Cayuga counties. He was a soldier in the war of of 1812, where he contracted disease from which he never fully recovered. In Ogden Mr. Gillett settled north of where his son Chauncey now lives, and in 1827 he bought of George W. Willey, as agent for the land company, the land, having but five acres cleared. Both John Gillett and his wife died during the forties. Their children were Daniel, John, Gilbert and Electa, all of whom removed to Michigan; Ephraim, who died in Ogden; Chauncey, of Ogden; Franklin, who died in Michigan; and D. Clinton, who lives in Michigan. Chauncey Gillett, who lives on the old farm, was born in 1820, was educated in Brockport and Clarkson, and has always followed agriculture. In 1845 be married Martha Whittier, and they have had three children: Julius E., of Ogden, Elwood C., of Gates; and Julia E., wife of Frank E. Lawson. Handy, John D., was born on his present farm in 1833, a son of pioneer Alpheus Handy, who came from Connecticut about 1820 and located here. His first wife died soon after his settlement here, and in 1824 he married Maria Dunham, who is now living. their children were Pluma, Frances, John B., Charles, Sarah, Lucius, Carrie, Frank and Alpheus. Lucius and Frank were soldiers in the late war, where both had an honorable record. Lucius was in the First Michigan Cavalry, and was killed in the battle of the Wilderness. Frank was in the 50th U. S. Engineers and died at City Point, Va., in August, 1864. Alpheus Handy, the pioneer, died in 1869. John D. owns and resides on the homestead farm, to which he devotes most of his time and attention, caring but little for politics. In 1865 he married Frances H. Hobbie, granddaughter of B. K. Hobbie of Rochester, and they have one child, Cora. They have also adopted four children from the Rochester Orphan Asylum, whom they reared and started in the right paths of life. They were Mattie Hunter, Frances Teffle, Louis Neun, and Jacob A. Regg. Hoy, Patrick, was a native of Ireland, but came when a young man to this country, settling first at Albany, thence moved to Cherry Valley; thence he came to Rochester, about 1829. He was a blacksmith by trade and an earnest, hard-working man. He removed to Penfield and died in that town. He was twice married, his first wife dying in Cherry Valley. She bore him three children. His second wife was Loraine Smith, and they also had three children: Julia, Nicholas H. and Betsey. Nicholas H. Hoy was born October 10, 1832, and learned the trade of his father. He worked several years in Penfield Center, and in 1870 came to Ogden and bought a farm, still continuing his trade for ten years or more. In 1862 he enlisted in Co. L, 8th N. Y. Cavalry, and served nearly three years, his duties being blacksmithing. He was mustered out of service in August, 1865, returning home to his trade. in 1854 he married Lydia A. Balcom, and their children are James E., of Spencerport, and Jennie A., wife of Joseph Rogers of Ogden. Mr. Hoy has served as overseer of the poor and assessor. Holley, Andrew M., is a son of William Holley, who settled in Webster about 1835, and died in1888. Mr. Holley devoted most of his time to farming until 1883, when he moved to Webster village, and has since been engaged in painting and paper hanging. Ia 1890 he erected the residence on South street, where he now lives. His two sons are Charles H. and Burton E. Holley, Andrew M., is a son of William Holley, who settled in Webster about 1835, and died in1888. Mr. Holley devoted most of his time to farming until 1883, when he moved to Webster village, and has since been engaged in painting and paper hanging. Ia 1890 he erected the residence on South street, where he now lives. His two sons are Charles H. and Burton E.
Hopkins, Freeman A., was born in Wayne county in 1852, a son of Enos, and a grandson of Freeman Hopkins, who was one of the early settlers of Wayne county. Mr. Hopkins was for some years a farmer after coming to Webster in 1874, hut in 1885 he engaged in the produce business with J. W. Grinnell until 1893. He then bought the hotel at Webster village, which he now conducts. He married Cora A., daughter of David P. Fosdick, and their two sons are Edward E. and Ulysses S.
Hosenfele, Dionisius, was born in Germany, and came to America at the age of twenty-one, and settled in Rochester, and in 1856 came to Webster, where he followed milling for one year. He next returned to Rochester and conducted a mill until 1859, then came again to Webster and purchased the farm where he now lives. He married Theresa Conrad and they have five sons: Joseph, George, Peter, Henry, and Frank, also five daughters. Jones, Edwin, is a son of Chester and Hannah Jones, and a grandson of Joseph, who came to this town in an early day, and conducted a tannery at Union Hill. Our subject has for most of his life been engaged in the manufacture of pumps, and in farming. He has taken a prominent part in local affairs, having served for eight years as justice, and for the past nine years as assessor. He married Harriet, daughter of David Quinby, and they have one son, Frank F.
Hodges, Charles H., was horn in 1829, a son of James, who was a native of Vermont, born in 1796, a son of Emerson and Susan (McCormick) Hodges of that State, who later moved to Augusta, Oneida county, and spent their declining days. James came to Henrietta about 1818 where he bought a farm and settled, spending the last three years of his life, however, in the village of Henrietta. His wife was Mary Campbell, and their children were Emerson, Charles H., James L., of Glenwood Springs, Colo., Elizabeth, wife of Judge John L. Bailey of Rochester, and George, a farmer of Genesee. The father died in 1886. Charles H. has devoted his life to farming, and began for himself while a young man in East Henrietta, but in 1869 he removed to his present farm. For some years he was interested in the breeding of fine horses and cattle. A portion of his time has also been spent in Canada, where be bought and shipped cattle. During the war Mr. Hodges was enrolling officer. He has also been active in public affairs. In 1852 he married Lamyra A. Ryno, born in this town, a daughter of William and Minerva Ryno. They have had two children; Carrie A., born in 1857, wife of A. C. Jackson of Rochester, and Frederick W., born in 1868. Mrs. Hodges died February 19, 1893. Emerson, oldest brother of our subject, was an attorney of Juliet, Ill., who later went to Rochester, Minn., and was member of assembly. During the war he went to Washington, and became auditor in the Treasury Department. which position he held eighteen years. He died in 1883. James L., another brother, went to Minnesota with his brother, and was colonel in the late war, in command of the fort at Little Rock, Ark. He is now a resident of Glenwood Springs, Colo., where he has been county judge and filled many other offices. Hartshorn, John, was born in Orange county, August 25, 1819, a son of Joseph, also of Orange county. John was educated in the public schools and is a self-made man. In 1845 he married Sarah, daughter of Benjamin Ivins, by whom he has had four children: Benjamin L. John S., Mrs. C. Ellis aud Mrs. W. Palmer. In 1850 he came to Monroe county and bought a farm, which he has since conducted, and is esteemed one of the representatives citizens of the town. I emigrated from Berkshire to Phelps, Ontario county, in 1796, and purchased land upon Flint Creek, where I remained until 1805. In that year, Mr. Wadsworth's handbills had reached Berkshire, offering to exchange wild lands for farms, and had induced by brother Samuel to come and see the country. I accompanied him to what was then West Pulteney. We found it a densely and heavily timbered wilderness; the only occupants, other than wild beasts, John Smith and his surveying party, their camp located on the stream near my present residence. We explored the township, and were pleased with it. During the next winter, I selected for myself, my present location, and for my brother, the site of the present village of Churchville. In March, 1806, I removed my family from Phelps to my new location, expecting that I had a house ready for them, as I had contracted for the building of one; but on arriving, we found ourselves houseless. William Parker, Samuel Shepherd and Amasa Frost, had preceded me a few days, with their families, and were occupants of the surveyors' camp, where myself and family were hospitably admitted as joint occupants; and a crowded household we had - 28 of us altogether - all in one small cabin. We called it the "Hotel," and that gave the name to the stream upon the banks of which it stood. Isaac, Elisha and David Farwell, then of "Springfield," now Wheatland, hearing that I was houseless, generously came and helped me erect one. We put up the body of it in one day; had it ready to move into on the fourth day. The floor was of split basswood, the roof of cedar shingles; no boards were used in its construction; I was farther indebted to Elisha Farwell for a few nails. I had now fairly commenced a pioneer life, a small specimen of which I had already witnessed, and been a part of, in Phelps. All of us who located in the spring of 1806, raised small patches of summer crops. In the fall of that year. I had fifty acres cleared, which I sowed to wheat. I had got in debt in clearing land and in building, and though I had an excellent crop of wheat, it was difficult to pay debts with it; it would not command money. 1 exchanged some of it for labor, with new corners. In 1808, I took wheat to Canandaigua: there was no price and no sale for it there; no exchanging of it for store trade. I removed it to Geneva, at a cost of 12½ cents per bushel, and paid a debt I owed there for a barrel of whiskey with it; the wheat finally netting me 12½ cents per bushel, or one gallon of whiskey for six bushels of wheat. We could get some store trade at Guernsey's store in Lima, in an early day, for wheat. The first cash market was at Charlotte; price, 31 cents per bushel. In the cold season of 1810, when summer crops were generally destroyed throughout the country, there was an excellent wheat crop in Rigs. In the fall, I sold my whole crop to Bond and Hatch, Rochester, for $2 per bushel; and after that, some of my neighbors sold their crops for $2.50 per bushel. In some of the earliest years, Mr. Wadsworth sent some pot-ash kettles into the township, and the manufacture of black salts and pot-ash was commenced. It proved a great help to the new settlers; enabled them to procure some of the common necessaries of life, when wheat would not. The first town meeting we attended was in Ogden, at the house of Esq. Willey, in 1807. Then the town of Northampton embraced the northern towns of Monroe, west of the river; or "settlements," and "districts," as they were then termed. We made choice of two Supervisors in succession, but their election was a nullity, neither of them being free-holders; free-holders were scarce in that early day. We finally compromised the matter by appointing delegates from each settlement, to appoint town officers. The proceeding was not exactly legal, but no objection being made, it all went off well enough. Our first religious meetings, previous to the organization of the Congregational church, were held in my barn, it being the first framed barn erected in town. I think Elder Reed, a Baptist missionary, was the first to visit our settlement. The Rev. Mr. Phelps and several Methodist circuit preachers, visited us in early years. My father was a farmer in New London county, Connecticut, town of Prescott. As with most New England farmers, the Revolution., its personal services and sacrifices, its incidental burdens, was the occasion of depression and embarrassment. As soon as I was old enough to labor, my services were required upon the farm, so unremittingly as even to deprive me of the advantages of education, beyond what could be acquired before I was twelve years of age. I married at the age of twenty-three years, and unfortunately bought a farm and settled upon it, in one of the poorest mountain towns of the county of Berkshire. Unable to sell it, I was obliged to cultivate the ungenial soil of the Berkshire mountains for ten of the best years of my life. The day of deliverance came, however: - In 1805, I met with a large handbill sent out by James Wadsworth, Esq., of, "Big Tree," proposing to exchange each alternate range of lots of land in "West Pulteney township," for improved farms in the county of Berkshire. Daniel Dewey, Esq., of Williamstown, and ---- Hopkins, Esq., of Great Barrington, were named as the agents in Berkshire, who would give applicants all needed information. The farms were to be taken at appraised value, and the wild land given in exchange, at $4 per acre. In October, 1805, Mr. Samuel Baldwin, a neighbor of mine, and myself, mounted our horses and came to see the Genesee country, and especially West Pulteney. Arriving at Avon, a guide had been provided by Mr. Wadsworth to conduct us to our destination. Reaching the "Hanover settlement," in East Pulteney, we went through the woods to the surveyors' cabin in West Pulteney, where we were lodged, fed, and provided with maps and a guide, while we made a pretty thorough exploration of the township. We found that several of our neighbors from Berkshire had been in, [those named by Mr. Church,] had visited the township, purchased and exchanged lands; but all that was doing to prepare for settlement, was a chopping that was making by Mr. Elihu Church and his hired man. Liking the country, and especially the land we were viewing, Mr. Baldwin and myself selected 850 acres each, the quantity which the appraised value of our farms in Berkshire entitled us to. After this, we visited the mouth of the river, and ascending it, viewed the Falls, the Rapids and the present site of Rochester. All was a dreary wilderness, in which there was no opening, save that made by the river, and a small one immediately about the old Allan mill. There was a narrow and crooked wagon path on the east side of the liver, and such it remained for several years after, during which I wagoned many loads of pot-ash over it to the mouth of the river, made from the timber of my lands in West Pulteney. We then visited "Big Tree," where we were hospitably entertained by Mr. Wadsworth, our land exchanges arranged, and the deeds prepared, which we took with us to Albany to be signed by Col. Troup. We also, each of us, purchased several lots upon credit. In the fall of 1806, I re-visited the country to make preparations for the removal of my family. At the hotel in Canandaigua, where I was remaining over the Sabbath, I met with Col. Troup. There being no public worship in the village, we spent the day in company. Observing that he took a lively interest in all that related to the settlement of the country, and especially in all that related to public worship, and a strict regard to the observance of the Sabbath, I ventured to suggest to him the happy influence it would have upon our new settlement in West Pulteney, if he would set apart or donate lands for religious and educational purposes; while at the same time, it would promote the sale and settlement of the township. He fell in with my views, saying to me: - "Go on and organize a religious society, elect trustees, and select two one hundred acre lots - one for the support of the Gospel, and another for the support of schools - call on me at Albany on your return, and I will deliver you the title deeds." During my stay in the settlement, a meeting of the Pioneers took place, few in number, and measures were adopted to avail ourselves of the donation. There were then five families in West Pulteney, and about fifteen heads of families were making arrangements to settle there. At the meeting, it was agreed to take all the necessary legal steps in the formation of a religious society: one of which was the requirement, that notice of intention should be read at the "close of public worship, three Sabbaths in succession," of the time and place to meet to organize such society. We appointed a meeting three Sabbaths in succession, at the log-house of Amasa Frost. Deacon Nehemiah Frost and myself were the only professors of religion in the settlement; we conducted the reading and prayer meetings. Every person, young and old, attended the meetings. On the day appointed for the organization of the society, Nehmniah Frost was chosen moderator, and myself secretary. Nehemiah Frost, Samuel Church, Amasa Frost, Samuel Baldwin, Elihu Church and myself, were chosen trustees. The society was called the "First Congregational Society of West Pulteney, in the county of Genesee." The lands were secured, and devoted to the objects designed by the donor, or donors, as Col. Troup acted, of course, for his principals. In less than three years after the organization of the society, a church was formed, and the Rev. Allen Hollister, from the county of Dutchess, was settled as its pastor. The church and society, thus early organized, have uniformly supported a pastor, up to the present time, without any missionary aid. I am the only one living of the original members of that church, and I do not know of any of the original members of the society living, except Elihu Church, Esq., and myself. I moved my family from Berkshire to the then new region of the Genesee country, in May, 1807. The town of Rigs had a rapid and permanent settlement, the population being, with few exceptions, from New England. We saw, perhaps, less of the harsher features of pioneer life, than most of new settlers. We were tolerably well accommodated with a grist and saw mill; the substantial necessaries of life were obtained at a convenient distances, and at fair prices; the lack of a market was a serious drawback. Before the completion of the Erie Canal, in one year, I raised three thousand bushels of wheat. After harvest, the nominal price was from 31 to 37½ cents per bushel. I tried the experiment of transporting flour to Northampton, Conn., by sledding. For this purpose, I had seventy barrels manufactured from the best quality of wheat. Purchasing six yoke of oxen, I put them upon two sleds, and two spans of horses, each upon a sleigh. With the four teams, I transported my 70 barrels of flour; was on the road twenty days; sold my flour at $6 per barrel, and my oxen at a profit; all for cash in hand. My teamsters cost me nothing but their board going and coming, as they wished to visit New England; and that was a part of my own object; - upon the whole, the experiment succeeded pretty well. We were about twenty days on the road, going down. I sold the balance of thy crop of wheat the next June, for 56 cents per bushel. It went to the Canada market. Less than a century has produced such a change in the aspect and condition of all this region, as is hardly to be credited by those who have not resided in it; and hardly to be realized by those who have. Even those who are wont to "take careful note of time," have been unable to keep up with progress and improvement. Forty years have changed Rochester from a wilderness to what it now is; and Riga shows what has been done in a little more than forty years by the hardy enterprise of New England yeomanry; about half of the time destitute of the advantages of a market. A heavy timbered wilderness has been converted into a well cultivated, well fenced, wealthy farming town; unsurpassed by any town, in any region of country, in the way of neat and convenient farm houses and barns, and in the general appearance of rural happiness and independence. After observations made in traveling more or less in twenty States of the Union, I regard the greater portion of western New York, in point of soil, climate, and in all things which go to make up the character of a country, as the most desirable spot of earth, in which I could reside as a farmer. The early tavern keeper, Mr. Talmadge, resides upon a fine farm a mile west of Parma Corners; is childless; his wife, who was the widow of David Franklin, whose sudden death is noticed by Mr. Pierson, died in 1842. I was a resident of Wolcott, N. H. In 1803, James Wadsworth visited that town, called a public meeting, gave us a description of the Genesee country, and urged us to emigrate. Thomas Wiard, Benni Bishop, ---- Stebbins, Seymour Welton and Abel Curtis, with their families, and Ashbel Atkins, John Curtiss, and myself, unmarried men, formed an emigrant party. There was 38 persons in all. We came with seven wagons, forming a considerable cavalcade; were 21 days on the road. Geneseo was our destination; when we arrived there we were all quartered in some log houses that belonged to Mr. Wadsworth; were joyfully received by the settlers; we liked the country; and all were cheerful and happy. I worked out by the month for a year or two; was engaged for some time in a trading excursion with James Rodgers who had settled in Canandaigua in an early day; we traded with the Indians in Allegany and Cattaraugus. I resided in Bergen from 1809 until 1811, in which last year, I came to Parma, and purchased the tavern stand and the small improvement of Hope and Elisha Davis. They had been Pioneers at Parma Corners; had built a comfortable block house. Hope died in 1846; his widow still survives; Elisha Davis removed, to Riga. There was settled at Parma Corners before the close of 1811, beside the Davises and myself: - Augustus Mather; he died four years since; his widow still survives; Mrs. Amos Webster of Parma is his daughter. Lendell Curtiss; emigrated to Michigan, some years since; Kinnicone Roberts died in early years; his widow is Mrs. Brewer of Ogden. Joshua Whitney, who in 1811 and '12, built a grist and saw mill on Salmon creek; he emigrated to Michigan, where he now resides. These were all at the corners and west of them, on the Ridge. Josiah Fish had removed from the Allan mills at Rochester, and resided on the Ridge east of the village. Our first merchants at Parma corners, were Joseph Thompson and David Tuttle; their successors were, John Rochester and Harvey Montgomery; their successor was William M'Knight, now of Rochester. Dr. Gibbons Jewett, was our first physician; Gibbon H. Jewett, of Parma, is his son; he was an early supervisor and magistrate. John D. Higgins was the first settled physician in Parma; remained but two or three years and removed to Bath. Dr. John Scott practiced here in several early years. Zolved Stevens settled in Parma in 1813 or '14; was a merchant and distiller; a supervisor and magistrate; died 12 or 14 years since. Settlement was entirely suspended during the war of 1812; some left, but none came; and yet the beating up of recruits, the marching of soldiers, the transportation of supplies for the army, made brisk times upon the Ridge Road. It was a constant state of excitement and alarm, and little was done in the way of improvements by those who remained in the country. Hope Davis, the early Pioneer I have named, raised a volunteer company, and went to the Frontier; was at the battle of Lundy's Lane, and in several other engagements. I have a cannon ball that weighs sixty-eight pounds, that was fired from the British fleet, off the mouth of Genesee River. I saw where it struck, and went and picked it up. Samuel Castle settled in Parma, north of Ridge, in 1810, and was joined next year by his father, Abraham Castle. The old gentleman died in 1812. His surviving sons, other than the one named, are: - Jehiel Castle, of Parma; Isaac Castle, of Greece. A daughter of his became the wife of Arnold Markham, a brother of the early Pioneers in Avon and Rush. Samuel Castle has been one of the Judges of Monroe county. Our purchase of land when we came in, was of Birdseye & Norton; the location had upon it a small improvement that had been made by Michael Beach, a previous occupant. He had been a salt boiler; had several kettles set; ruined his salt spring by endeavoring to get stronger water. Beach removed to Pittsford, died several years since in Clarendon. When our family came in, there. was but one road leading from the Ridge Road to the Lake; it was called the "Canawaugus Road;" another road led from Braddock's Bay to "Deep Hollow Bridge." What was called the Canawaugus road is now the main road from Parma Corners to Parma Centre and Unionville. The inhabitants at that period north of Ridge, in Parma, other than those in the immediate Braddock's Bay settlement, were: - Alpheus Madden, near Parma Centre; died here, his family removed; Timothy Madden, a little west of Castle's Corners; died 15 or 20 years since; Silas Madden, of Parma, is his son; Mrs. Joseph Randall, of Parma, is his daughter. ---- Hicks; died in early years; Van Rensselear and Benjamin Hicks, of Parma, are his sons. Joshua Hickson, Jeremiah Perry; died here. Nehemiah Weston. In 1810, there was no framed house or barn in Parma, north of Ridge, except in the Braddock's Bay settlement; there was but one house at Parma Corners. It was very sickly north of Ridge, in all the early years; in some localities, in the sickly seasons, there would not be well ones enough to take care of the sick; deaths sometimes occurred for the want of the ordinary nursing of the sick. I have often, when afflicted with the ague, promised I would leave the country when I got well enough; many did leave. The sickness used to prevail most at Braddock's Bay, and about the Ponds. A spirit of kindness prevailed among the new settlers, a sympathy for each others misfortunes; those who lived in settlements a little more favored, would go where sickness prevailed most, in whole households, and take care of the invalids day and night. The land north of Ridge, was heavily timbered, wet. It was so hard beginning, that men who had no means, could not take up land and pay for it; most that attempted to do so, failed; were obliged to sell their improvements for what they could get. I knew of. one man, however, who persevered in this way, taking up land, making small improvements, and selling out, until he became the owner of a good farm. The proprietors of the land were very indulgent; had it been otherwise, but few of the early settlers could ever become free-holders. There was, in the earliest years of settlement, no market when the settlers had any thing to sell; in 1810, they had began to better their condition by the manufacture of potash and black salts. During the war, settlement was mostly suspended; some left who did not return; others would move off at periods of excitement and alarm, and return again. A singular circumstance occurred with one of our neighbors at the battle of Queenston: - Joseph Stoddard was shot in the forehead; the army surgeons extracted a ball; he came home, and another was extracted; the two balls having made but one perforation of the skull. 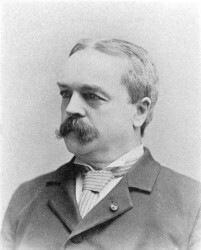 Richard Curran, ex-mayor of Rochester, was born in Ireland, January 13, 1838, and came to this country with his parents in 1850, locating in Seneca Falls. He received his early education at the public schools and Seneca Falls academy, and after heaving school entered the drug business, and studying medicine graduated in 1860. The war of the Rebellion then breaking out, he went to the front and entered the Thirty-third New York infantry as assistant surgeon. After two years' service in this capacity he was commissioned assistant surgeon of the Sixth New York cavalry, where he remained until the close of the war. He was present at nearly all the battles fought by the Army of the Potomac, and after the battle of Antietam he received special mention in general orders for distinguished service during the encounter. He was also present at the surrender of Lee to Grant. While in the army he became the bosom friend of Colonel G. W. Goler, and after the chose of the war they decided to come to Rochester and open a drug store under the firm name of Curran & Goler, which partnership has continued up to the present, their establishment being one of the best equipped and conducted pharmacies inn Western New York. Dr. Curran has always taken a great interest in municipal affairs and in charitable and social matters, and has accomplished more than his share as a public-spirited citizen. In 1876-7 he served as school commissioner, and also served over two years as park commissioner. In 1891 he was elected to the State Legislature. Before his term of office expired as a legislator his Republican friends insisted on nominating him for mayor of this city. 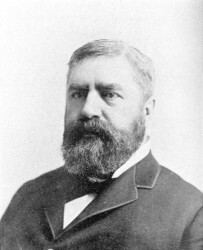 He accepted the nomination and was elected by a large majority, taking his seat April 4, 1892. At present he is president of the Executive Board. In the conduct of public affairs as in the management of his private business and the administration of the many trusts reposed in him, his honesty and integrity have been above question; while in point of ability he stands at the front of the distinguished men who have directed the destinies of the Flower city. William W. Barnard, member of the Executive Board, was born in Ogden, Monroe county, August 16, 1848, and obtained his education in the schools of that town and at Lima seminary. Among his country neighbors he was always regarded as a bright, active lad, honest and fearless in the discharge of every trust reposed in him, and a young man who would ultimately make his mark among his fellow men. Soon after leaving Lima seminary Mr. Barnard decided to make the city of Rochester his permanent home. He obtained a position of minor importance in the large ale brewery of Hathaway & Gordon and after eighteen years of service at that establishment, finally became engaged in business for himself. No man in the establishment of Hathaway & Gordon was more highly respected or more thoroughly trusted in everything than was Mr. Barnard. It was while acting as collector for this firm that he began making the acquaintance of business men throughout the city, which acquaintanceship has grown into a friendship lasting and sincere. Fraternal organizations have been and will always he a sort of fad with Mr. Barnard. When the Uniformed Patriarchs were first organized he took an active interest in the infant organization. The love of military drill, coupled with the warm personal friendship for the members of that order, induced him to accept an office, and, step by step, he was advanced until he was finally elected supreme commander, the highest office in the gift of the organization. He is also an Odd Fellow, and honored member of the Masonic fraternity, of the Ancient Order of United Workmen, and of the Select Knights. He is a Democrat, and during the last presidential campaign did excellent service as colonel of the Cleveland legion. 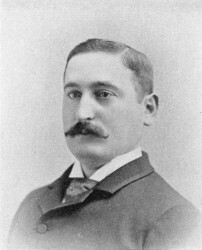 J. U. Schroth, member of the Executive Board, was born in this city October 28, 1857. His education was received in public school No. 9, and early in life he learned the trade of machinist with the D. R. Barton Tool company. He was with that company for twelve years, until 1884, when with Frank Kehrig, he went unto the hotel business at Charlotte, where he remained for five years, when he became the proprietor of the Hotel Bartholomay on Fitzhugh street. 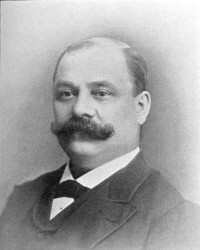 He was in the restaurant business at 97 East Main street until elected to the Executive Board in 1891. He has always been a Republican in politics, and was a member of the school board in 1886 from the Thirteenth ward. He was alderman from that ward in 1888, 1889 and 1890, resigning to accept his present office. He married in 1886 Miss Bertha, daughter of the late Joseph Schuman of this city, and they have three children, one son and two daughters. He is a member of the F. & A. M., I. O. O. F., Knights of Calvin Benevolent society, the Maennerchor-Liedertafel, and also of the Scottish Rite Masons. Thomas J. Neville was born in Halifax, Nova Scotia, April 30, 1844. In 1852 the family came to Rochester, where they have since resided. The subject of this sketch obtained a limited education in the common schools and this was supplemented by two years' attendance at a private academy. After leaving school he engaged in various occupations, among which was that of teaching in a private school in the village of Medina, Orleans county, New York, for two years, after which, in 1865, he engaged as reporter on tine Rochester Democrat, a position he held nearly eight years, during the latter part of which period he held the position of city editor. In March, 1873, he resigned his place on the paper and was appointed clerk of the Board of Public Works, a commission appointed by the mayor, under an act of the Legislature, as highway commissioners, having care and maintenance of streets and the projection and completion of all public improvements affecting the streets and avenues of the city. In July, 1873, he was appointed a member of the board to fill a vacancy caused by the resignation of one of the commissioners, in which capacity he acted until May, 1876, when the Board of Public Works was abolished by act of the Legislature. Under this last named act the Executive Board was created, consisting of six members, three elected at large by the people and three appointed by the mayor. Mr. Neville was elected for three years, the longest term under the new law, and at its expiration he was again nominated, but was defeated by a plurality of four votes, in a canvass in which the workingmen as well as the Democratic party presented formidable candidates. He was then appointed clerk of the Executive Board, a position he has held under both Republican and Democratic administrations to the present time. Mr. Neville has been identified with the Republican party since he attained his majority, and he has always taken an active part in its proceedings and advocated its principles. During his term of service, approaching a quarter of a century, immense sums of money have been disbursed through his office for public improvements, and during his occupancy of office he has witnessed the doubling of the city's population and many of its greatest and most important improvements. His length of continuous service as an officer connected with our municipal government is not exceeded by any other, except a few members of the police force and the fire department.